I’m getting behinder and behinder. Carol Dweck’s paradigm-shifting book Mindset was first published 10 years ago. I read it in one cover-to-cover weekend last month. The research into the impact of our mindset on how we deal with failures, setbacks, disappointments, is as relevant for our resilience and well-being today as it was a decade ago. The concepts proposed in Mindset fit right in to research on self-esteem, resilience, posttraumatic growth. Perhaps even more so as we learn from neuroscience how to change our mindsets, that, in fact, we actually can choose to cultivate a more growth-oriented mindset. I teach a lot about posttraumatic growth and the importance of finding the gift in the mistake, finding the silver lining in a tragedy. The growth mindset is the foundation of being able to do that. Choosing to change our beliefs, our perspectives, even simple ones, can have a profound effect on our behaviors and our coping. Mindsets are major belief systems; changing your mindset is a major paradigm shift. Mindset gives ample instructions and plenty of incentives to do so. May these reflections and tools be useful to you and yours. Fixed mindset: a system of beliefs that talents, aptitudes, temperaments, personality traits and preferences are fixed; either you have the smarts or the good looks or the talents, or you don’t. And that success or failure is a true measure of one’s intelligence, competence, self-worth. Dweck doesn’t refer to shame in her research, but folks with the fixed mindset feel an urgency to prove over and over again that they are as good as they believe they are (or, more likely, that others believe they are); to meet expectations, to succeed, to never fail. Hence, folks with a fixed mindset are supersensitive to being judged and very vulnerable to feeling “rejected, a failure, an idiot, a loser, worthless, nobody loves me, pitiful.” And the response to failure or a setback is to fear challenge, devalue effort, and avoid risk, to stop trying, to give up, retreat, withdraw, veg out. The fixed mindset robs people of capacities to cope. Growth mindset: a system of beliefs that talents, aptitudes, temperaments, personality traits and preferences are simply a starting point for development. The growth mindset fosters curiosity and a passion for learning through effort and experience. People with growth mindsets respond especially well when things are not going well; they tend to stretch themselves, confront obstacles, embrace risk, and stick through the hard times. Rather than being embarrassed or blocked by a sense of deficiency, they can acknowledge what skill or capacity is missing and set to work to cultivate it. They take direct, wise, and compassionate action. “Love of challenge, belief in effort, resilience in the face of setbacks, greater creativity and success” are hallmarks of the growth mindset. What’s important about distinguishing these two mindsets is that we can intentionally choose to cultivate a growth mindset. That would be characteristic of the growth mindset right there; our mindsets are not fixed; we can put in the effort to shift our orientation to life events from fixed to growth. We can shift how we filter our perceptions of ourselves and our experiences. That means we live our lives not about avoiding failure but about grabbing a hold of failure as an opportunity to learn, to improve, to master. Choosing to cultivate a growth mindset changes everything. In Mindset, Dweck shifts the paradigm from success v. failure to learners v. nonlearners. In the fixed mindset, people are focused on proving their worth to themselves and others; they are focused on performance and immediate perfection and success; the focus on evaluation and outcome and the risk of not measuring up tends to cause people to hedge their bets and avoid risks; they become nonlearners. In the growth mindset, people are focused on curiosity and the exuberance of learning, focusing on potential and stretching and making progress – if you’re learning you’re not failing – rather than outcome. When challenges become difficult, folks with fixed mindsets tend to give up and miss out on learning. When challenges become difficult, folks with growth mindsets then to roll up their sleeves and dive in. Dweck applies concepts of fixed mindset and growth mindset to education, sports, business, parenting, coaching, and romantic relationships. 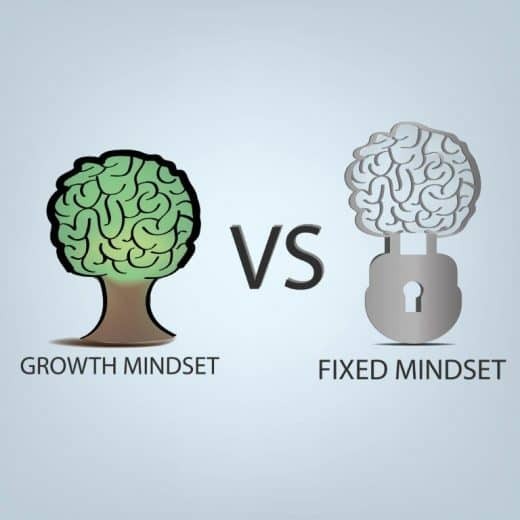 In these reflections, I’m focusing on the impact of fixed mindsets v. growth mindsets in education, because mobilizing resources for learning (growth mindset) rather than to protect one’s self-image (fixed mindset) has such powerful effects on all of us developing our full potential. “Is everyone capable of great things with the right mindset? Could you march into the worst high school in your state and teach the students college calculus? If you could, then one thing would be clear: With the right mindset and the right teaching, people are capable of a lot more than we think. “But not only did he teach them calculus, he (and his colleague, Benjamin Jimenez) took them to the top of the national charts in math. In 1987, only three other public schools in the country had more students taking the Advanced Placement Calculus test. Those three included Stuyvesant High School and the Bronx High School of Science, both elite math-and-science oriented schools in New York. “Marva Collins taught Chicago children who had been judged and discarded. For many, her classroom was their last stop. One boy had been in and out of thirteen schools in four years. One stabbed children with pencils and had been thrown out of a mental health center. One eight-year-old would remove the blade from the pencil sharpener and cut up his classmates’ coats, hats, gloves, and scarves. One child referred to killing himself in almost every sentence. One hit another student with a hammer on his first day. These children hadn’t learned much in school, but everyone knew it was their own fault. Everyone but Collins. “Instead, Marva Collins took inner-city Chicago kids who had failed in the public schools and treated them like geniuses. Many of them had been label “learning disabled,” ‘retarded,” or “emotionally disturbed.” Virtually all of them were apathetic. No light in the eyes, no hope in the face. “Collins’s second-grade public school class started out with the lowest-level reader there was. By June, they reached the middle of the fifth grade reader, studying Aristotle, Aesop, Tolstoy, Shakespeare, Poe, Frost, and Dickinson along the way. “Alfred Binet [developer of the standardized I.Q. test] believed you could change the quality of someone’s mind. Clearly you can. Whether you measure these children by the breadth of their knowledge or by their performance on standardized tests, their minds had been transformed. “If people have such potential to achieve, how can they gain faith in their potential? How can we give them the confidence they need to go for it? We conducted studies with hundreds of students, mostly early adolescents. We first gave each student a set of ten fairly difficult problems from a nonverbal IQ test. They mostly did pretty well on these, and when they finished we praised them. “We praised some of the students for their ability. They were told” “Wow, you got [say] eight right. That’s a really good score. You must be smart at this. “We praised other students for their effort: “Wow, you got [say] eight right. That’s a really good score. You must have worked really hard.” They were not made to feel that they had some special gift; they were praised for doing what it takes to succeed. “Both groups were exactly equal to begin with. But right after the praise, they began to differ. As we feared, the ability praise pushed students right in to the fixed mindset, and they showed all the signs of it, too: When we gave them a choice, they rejected challenging new tasks that they could learn from. They didn’t want to do anything that could expose their flaws and call into questions their talent. “In contrast, when students were praised for effort, 90 percent of them wanted the challenging new task that they could learn from. “Then we gave students some hard new problems, which they didn’t do so well on. The ability kids now thought they were not smart after all. If success had meant they were intelligent, then less-than-success meant they were deficient. “The effort kids simply thought the difficulty meant “Apply more effort.” They didn’t see it as a failure, and they didn’t think it reflected on their intellect. “What about the students’ enjoyment of the problems? After the success, everyone loved the problems, but after the difficult problems, the ability students said it wasn’t fun anymore. It can’t be fun when your claim to fame, your special talent, is in jeopardy. “The effort-praised students still loved the problems, and many of them said that the hard problems were the most fun. “We then looked at the students’ performance. After the experience with difficulty, the performance of the ability-praised students plummeted, even when we gave them some more of the easier problems. Losing faith in their ability, they were doing worse than when they started. The effort kids showed better and better performance. They had used the hard problems to sharpen their skills, so that when they returned to the easier ones, they were way ahead. Dweck also shares research that demonstrates students with growth mindset also have greater protection against negative comments and stereotypes, too. “Imagine you’ve applied to graduate school. You applied to just one place because it was the school you had your heart set on. And you were confident you’d be accepted since many people considered your work in your field to be original and exciting. But you were rejected. “At first you tell yourself that it was extremely competitive, so it doesn’t really reflect on you. They probably had more first-rate applicants than they could accept. Then the voice in your head starts in. It tells you that you’re fooling yourself, rationalizing. It tells you that the admission committee found your work mediocre. After a while, you tell yourself it’s probably true. The work is probably ordinary, pedestrian, and they’d see that. There were experts. The verdict is in and you’re not worthy. “With some effort your talk yourself back into your first, reasonable, and more flattering conclusion, and you feel better. In the fixed mindset (and in most cognitive therapies) that’s the end of it. You’ve regained your self-esteem, so the job is finished. But in the growth mindset, that’s just the first step. All you’ve done is talk to yourself. Now comes the learning and self-improvement part. “Think about your goal and think about what you could do to stay on track toward achieving it. What steps could you take to help yourself succeed? What information could you gather? “Well, may you could apply to more schools next time. Or maybe, in the meantime, you could gather more information about what makes a good application: What are they looking for? What experiences do they value? You could seek out those experiences before the next application. “Nobody scoffs at an honest plea for helpful feedback. Several days later, he called her back and offered her admission. It had indeed been a close call and, after reconsidering her application, the department decides they could take one more person that year. Plus, they like her initiative. “She had reached out for information that would allow her to learn from experience and improve in the future. It turned out in this case that she didn’t have to improve her application. She got to plunge right into learning in her new graduate program. “The key part of our applicant’s reaction was her call to the school to get more information. It wasn’t easy. Every day people plan to do difficult things, but they don’t do them. They think, “I’ll do it tomorrow,” and they swear to themselves that they’ll follow through the next day. Research shows that vowing, even intense vowing, is often useless. The next day comes and the next day goes. “These concrete plans – plans you can visualize – about when, where, and how you are going to do something lead to really high levels of follow-through, which, of course, ups the chances of success. Changing your mindset is not the only way to cultivate resilience and well-being. But it comes as close to guaranteed as anything I’ve ever come across. Please take these ideas to heart, and even develop a concrete plan for how you will implement them. Then enjoy your deepening learning and mastery. In the fixed mindset, everything is about the outcome. If you fail – or if you’re not the best – it’s all been wasted. The growth mindset allows people to value what they’re doing regardless of the outcome. They’re tackling problems, charting new courses, working on important issues. Maybe they haven’t found the cure for cancer, but the search was deeply meaningful. The fixed mindset limits achievement. It fills people’s minds with interesting thoughts, it makes effort disagreeable, and it leads to inferior learning strategies. What’s more it make other people into judges instead of allies. Whether we’re talking about Darwin or college students, important achievements require a clear focus, all-out effort, and a bottomless trunk full of strategies. Plus allies in learning. This is what the growth mindset gives people, and that’s why it helps their ability grow and bear fruit. Just because some people can do something with little or no training, it doesn’t mean that others can’t do it (and sometimes do it better) with training. [Illustrated with astonishingly improved self-portraits after students took Betty Edwards’ five-day training based on Drawing from the Right Side of the Brain. Patricia Miranda was a chubby, unathletic high school kid who wanted to wrestle. After a bad beating on the mat, she was told, “You’re a joke.” First she cried, then she felt: “That really set my resolve…I had to keep going and had to know if effort and focus and belief and training could somehow legitimize me as a wrestler.” Where did she get this resolve? Miranda was raised in a life devoid of challenge. But when her mother died of an aneurysm at age forty, ten-year-old Miranda came up with a principle. “When you’re lying on your deathbed, one of the cool things to say is, ‘I really explored myself.’ This sense of urgency was instilled when my mom died. If you only go through life doing stuff that’s easy, shame on you.” So when wrestling presented a challenge, she was ready to take it on. Her effort paid off. At twenty-four, Miranda was having the last laugh. She won the spot for her weight group on the U.S. Olympic team and came home from Athens with a bronze medal. And what was next? Yale Law School. People urged her to stay where she was already on top, but Miranda felt it was more exciting to start at the bottom again and see what she could grow into this time. Jim Marshall, former defensive player for the Minnesota Vikings, relates what could easily have made him into a failure. In a game against the San Francisco 49ers, Marshal spotted the football on the ground. He scooped it up and ran for a touchdown as the crowd cheered. But he ran the wrong way. He scored for the wrong team and on national television. It was the most devastating moment of his life. The shame was overpowering. But during halftime, he thought, “If you make a mistake, you got to make it right. I realized I had a choice. I could sit in my misery or I could do something about it.” Pulling himself together for the second half, he played some of his best football ever and contributed to his team’s victory. Nor did he stop there. He spoke to groups. He answered letters that poured in from people who finally had the courage to admit their own shameful experiences. He heightened his concentration during games. Instead of letting the experience define him, he took control of it. He used it to become a better player and, he believes, a better person. * People are all born with a love of learning, but the fixed mindset can undo it. Think of a time you were enjoying something – doing a crossword puzzle, a sport, learning a new dance. Then it became hard and you wanted out. Maybe you suddenly felt tire, dizzy, bored, or hungry. Next time this happens, don’t fool yourself. It’s the fixed mindset. Put yourself in a growth mindset. Picture your brain forming new connections as you meet the challenge and learn. Keep on going. * It’s tempting to create a world in which we’re perfect. We can choose partners, make friends, hire people who make us feel faultless. But think about it – do you want to never grow? Next time you’re tempted to surround yourself with worshipers, go to church. In the rest of your life, seek constructive criticism. * Is there something in your past that you think measured you? A test score? A dishonest or callous action? Being fired from a job? Being rejected? Focus on that thing. Feel all the emotions that go with it. Now put it is a growth-mindset perspective. Look honestly at your role in it, but understand that it doesn’t define your intelligence or personality. Instead, ask: What did I (or can I) learn from that experience? How can I use it as a basis for growth? Carry that with you instead. * How do you act when you feel depressed? Do you work harder at things in your life or do you let them go? Next time you feel low, put yourself in a growth mindset – think about learning, challenge, confronting obstacles. Think about effort as a positive, constructive force, not as a big drag. Try it out. We can praise our children and students as much as we want for the growth-oriented process – what they accomplished through practice, study, persistence, and good strategies. We say away from praise that implies that we’re proud of them for their intelligence or talent rather than for the work they put in. And we can ask them about their work in a way that admires and appreciates their efforts and choices. * I like the way you tried all kinds of strategies on that math problem until you finally got it. You thought of a lot of different ways to do it and found the one that worked! * I know school used to be easy for you and you used to feel like the smart kid all the time. But the truth is that you weren’t using your brain to the fullest. I’m really excited about how you’re stretching yourself now and working to learn hard things. * That homework was so long and involved. I really admire the way you concentrated and finished it. * That picture has so many beautiful colors. Tell me about them. * The passion you put into that piano piece gives me a real feeling of joy. How do you feel when you play it? …and when things don’t go so well…. * I liked the effort you put in, and let’s work together some more and figure out what it is you don’t understand. * We all have different learning curves. It may take more time for you to catch on to this and be comfortable with the material, but it you keep at it like this you will. * Everyone learns in a different way. Let’s keep trying to find the way that works for you. TED talk: The Power of Believing That You Can Improve by Carol Dweck. December 2014. Listen, learn, practice, enjoy.